The perfect combination of breathtaking scenery, traditional landscapes and a little adrenaline, when gliding along the waters, in a raft, of the majestic fjord of Geiranger: on this excursion, we will discover one of the most magical places in Scandinavia, right from its very waters. Our tour begins at the port: we will be welcomed by our guide and will walk approximately 200 metres to our raft. Before setting off on this stirring excursion on the waters of the fjord, we prepare ourselves by listening to some brief safety instructions and we put on the windproof and waterproof coverall provided. Now the real excitement begins: our Geirangerfjord adventure can begin! The raft goes increasingly fast and the extremely pure air of the fjord can be felt on our faces providing a great sense of freedom whilst we admire the majestic landscape. Our helmsman will amaze us with a host of spectacular manoeuvres injecting a little adrenaline to the experience. The raft journey is not just about speed: the helmsman will slow down when approaching some small mountain farms located along the Geirangerfjord and will tell us a little bit about their history in English. 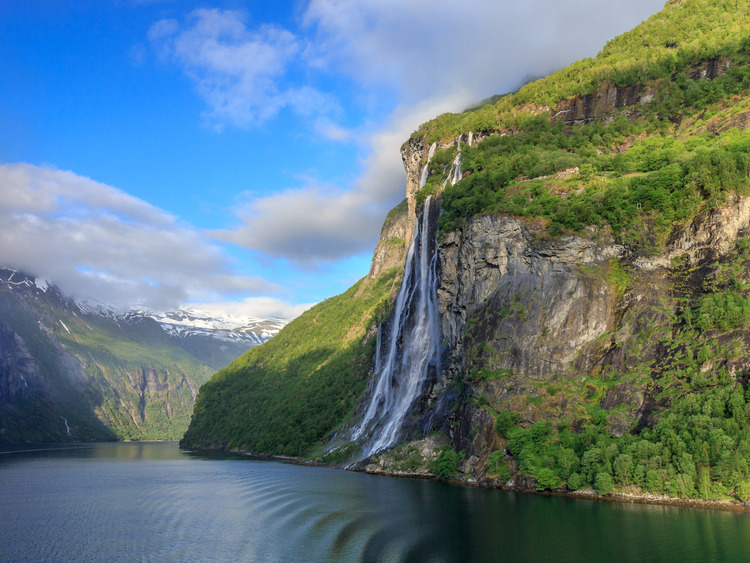 We will admire the Seven Sisters Waterfall and Bridal Veil Falls up close, two of Norway's most important waterfalls, and we will discover the legend that lies behind their names. An unforgettable experience! Maximum number of participants: 24 passengers. Participants must be able to walk approximately 1 kilometre on level ground and up 2-3 steps to get on and off the vessel. The excursion is not recommended for pregnant women and guests with mobility problems, back, neck or heart troubles. The "flotation suit" provided must be worn during the excursion. Participants must pay attention when boarding/disembarking the vessel. Bad weather conditions at sea may cause sea sickness, we therefore recommend taking the necessary precautions.